“Every strategy works … until it doesn’t.” This market truism provides the rationale for diversification among dynamically risk-managed strategies in dealing with market uncertainty. It’s easy to list the factors that support either proposition. We discuss a lot of them each week at our firm and with our clients. And as you can imagine, the portfolios best suited for each of these drastically different scenarios can also be quite varied. See Related Article: What is the optimal portfolio allocation to gold? As I read the articles and watch the shows, I can’t help thinking, “I’ll bet my clients have no idea which of these scenarios is likely.” It’s not the clients’ lack of knowledge or market experience that causes this. I don’t think anyone can answer either of these questions perfectly all of the time. This is especially true when one tries to answer them and manage a portfolio by fundamental economic factors. These factors are not really good timing signals for investing in financial markets that are more anticipatory and prone to reflect investor psychology—not fundamentals. I, like most market analysts, was initially trained on all of the basics and the advanced nuances of fundamental analysis. Even to this day, I have my favorite fundamental economic measures that give me a feel for the economic environment that we all must invest in. But just as other experts’ fundamental signs are not always clear, often my guideposts can give mixed readings. I like to look at the number of economic and earnings reports beating expectations, and the direction of interest rates. Over the past several months, in general, more economic reports have been overachieving than meeting expectations, earnings season was largely positive, and earnings reports indicated great profitability in America’s top companies, reflecting the recent tax cut. Interest rates, despite their low level in the longer-term view, continue to rise as the Fed’s quantitative stance gets more hawkish. All in all, I rate the fundamental factors of recent quarters as slightly positive. But it’s hard to manage a portfolio consistent with such a reading. Making matters worse, while these indicators tend to be anticipatory, the stock market can often commence a move in either direction before one receives all the fundamental information for making the right decision. A “quant” is a market analyst that uses mathematical techniques of statistics and probability to analyze the markets. The attempt is to put the odds on the investor’s side every time a trade is placed. That does not mean that every trade is successful—only that, if the probabilities play out, more trades will be winners than losers. There’s a great book called “The Quants” by Scott Patterson of The Wall Street Journal that details the history of this approach. When I first read it, I felt like I was reading a story that I played a small part in. The star of the book was Dr. Edward Thorp, who turned me on to the concept way back in 1968. Our careers have paralleled each other ever since. Recently, company officers gave me Dr. Thorp’s book “Beat the Market,” which started me down the road to a life in the financial markets. Dr. Thorp wrote an inscription in it to me. I will treasure it always. In more than 45 years of “quanthood,” I’ve observed that there are some problems with this approach as well, some of which Scott details in his book. One that he touches on is one I’ve seen repeated many times over the years. Quant traders fall in love with their systems. They believe that numbers are all powerful and that they’ve discovered “The Truth” to the markets and cannot lose. In contrast, I’ve observed that there are no absolutes when it comes to dealing with the markets, which, after all, are merely expressions of investor expectations. There really is no fair price for a security; it all comes down to what investors will pay for it at a given point in time. There is no system that will always be right in all market environments. So, we say, “Every strategy works … until it doesn’t.” While I believe this to be a rare market truism, it does more than provide the rationale for our often-voiced advice that investors should diversify among dynamically risk-managed strategies to deal with market uncertainty. In addition, I think it also means that what I call “light-switch strategies”—or standalone strategies—are of limited use. By “light-switch strategies,” I mean market-timing approaches that say you’re either 100% in or out of the market. There is just too much uncertainty in the market and too much noise in the price action to be so precise all the time. And the penalties when you’re wrong can be severe. Staying fully invested in a bear market or being underinvested in a 100% market rally can be so severe that the risk-reward ratio of utilizing just that one approach can be unappealing. While I fear that many of my fellow quants put too much stock in their own “holy grail,” the strategies we all adopt are valuable. They do increase the probabilities of success in a given market regime. It’s just that they should not be used for the entire portfolio. Rather, a number of actively managed approaches makes much more sense to deal with market uncertainties. When you follow a number of these strategies, if you’ve done your job, many will at any given time be contradictory because they follow different methodologies. In fact, even if you are only a momentum trend-follower, the variations in the period over which different trend managers measure the trend can result in different buy and sell points. Does the chance of contradictory signals mean we abandon them and return to the fundamentals? No. Why return to a failed approach? It’s like throwing the baby out with the bathwater. Contradictory signals stemming from multiple dynamically risk-managed strategies merely hedge one’s bet. Markets don’t turn on a dime. A profitable period usually evolves from a market bottom, and a good selling point may take weeks to develop with certitude. Further, I often explain that if all of the strategies in your multiple-strategy portfolio are going up, you are not truly diversified. 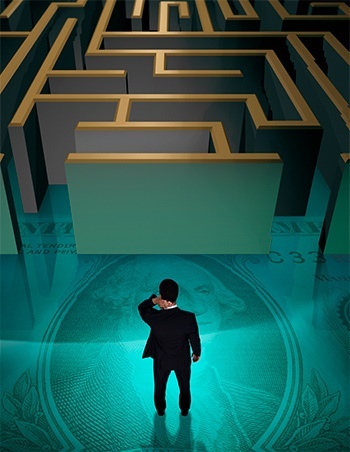 Some losing strategies have to be there solely to help should the market theme change to a different one. I’m often asked how to create a portfolio of strategies. First and foremost, the focus should be on the core. You must have a solid and substantial core (at least 50% to 60%) to ensure that your portfolio is participating when stocks or bonds are rising. However, the core should be dynamically risk managed so that when those markets change direction and are declining, you do not participate. Instead, during those times, you stand aside. The current vogue of investing in a static or periodically tweaked portfolio of index funds cannot do this. It continues to participate all right … even to the downside. The second piece of advice I would give is to not place too few eggs in your portfolio basket. You need to invest in a large number of strategies to reflect the different types of market environments that are always possible. You may not know which market environment will occur next, but you do know that one different from the present one will occur. Only a diversified, dynamic, risk-managed portfolio can be better positioned and respond when those changes occur. Recently, I carried both of these rules to an extreme when I created a portfolio for a friend. 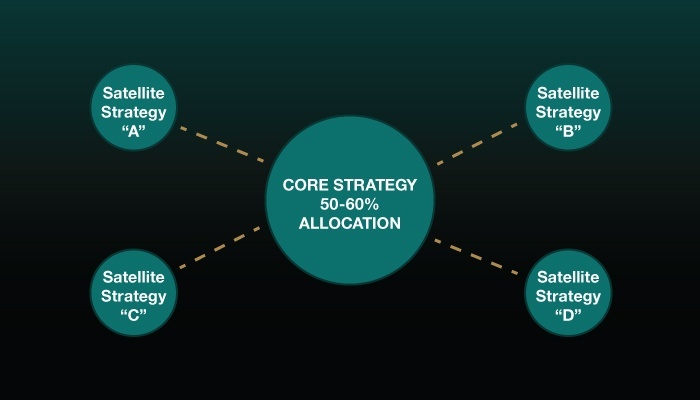 I recommended four suitability-based core portfolio strategies for 60% of the portfolio. Then I mixed in small amounts of other satellite strategies to round out this moderate portfolio. I added a little bit of active bond, active NASDAQ, classic market timing, and one alternative (mean-reversion) strategy. Our research tools showed it to be a remarkably stable portfolio over the last 15 years. What I like about this approach is that by using a number of different core strategies, and a smaller range of specialized strategies, an incremental approach to the markets can be taken. Sure, if enough of them go negative you can end up on the sidelines, or if they all go positive you can still end up fully invested, but in most cases, investors will be dynamically hedging their bets most of the time rather than shooting for the moon—or worse, going for broke. As a result of this approach, we see our portfolios continuing to incrementally adjust to the market’s actions. As it has been a rising market, our portfolios have been substantially invested. If the market turns lower, the portfolios will take on a more defensive posture.